So, I’ve asked this question before (and other variations on it), but it’s been a while, and people’s opinions might have changed, new authors have been introduced, and of course we have a large number of different people now than the other times I’ve asked it before. 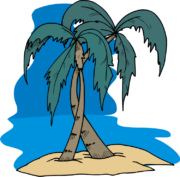 So, if you were stranded on a desert island with only two Cozy mystery authors works, which two authors would you choose and why? To clarify the rules, you can get all the books written by an author, including books that they co-wrote and books written under different pen names. I think I’m still going to go with my previous choices – Agatha Christie and Ngaio Marsh. As before, I’ve put both authors up because they have strong plots, good mysteries, and three-dimensional characters… and it doesn’t hurt that they wrote a lot of novels each, so I won’t run out of material too quickly. So, what two authors would you choose for a deserted island, and why? UPDATE: I decided to make a list of the suggestions, so here it is! I’ve decided to include authors mentioned that aren’t quite Cozy or aren’t even mystery authors as well, as long as they were mentioned as one of the top two… and people who put up to three or four also got their choices up. It would have to be … Donna Andrews and Agatha Christie. Love the Meg Langslow series by Donna and Ms. Christie introduced me to the love of a good mystery (well, that and Perry Mason! ;o) ). Joanne Fluke and Cleo Coyle because I could read both of their series over and over again (and do)! Besides, then I could have my coffee and desserts. The first time I got into cozies I loved were by Jill Churchill – her Jane Jeffrey, suburban housewife series. I wish these were on Kindle, though I do have the paperbacks. So I would go with her, and Mary Higgins Clark. I love MHC’s Alvirah and Willy characters. I agree! Agatha Christie is famous for a reason. My second choice would be Mary Roberts Rinehart. She was also prolific and I enjoy her writing and the variety–in addition to cozy mysteries her Tish books are great as are her books on WWI* and her horseback trips through Glacier National Park–before there were roads! She was famous in her day but seems less so today; although it may just be that I haven’t been paying attention as I only “discovered” her a few years ago. *she was the first journalist (man or woman) to reach the front during World War I. “The Awakening” by Kate Chopin and “The Dubliners” by James Joyce are two books I can read over and over again…I know they are not cozy’s but I think the current author I am reading is really great Paige Shelton, Mary Deheim whos seems to be writing more on the Emma Lord series!! Diane Mott Davidson and Earlene Fowler. I read and re-read these stories. Anne Perry, Her books are interesting in; historical way, human nature / instinct, suspence, great visualization. I would choose Donna Andrews because I love her books, I can read them over and over and they still make me laugh. The other author would be Kathi Daliy. She has numerous series and many books in each series so it would take a while to get through them all. Oh, there are so many to choose. How can we narrow it down to 2. Agatha Christy is my number 1, but for this survey I’d choose Victoria Thompson (Gaslight Mystery Series), and Charles Todd (Bess Crawford series). This is REALLY hard. Agatha and Ngaio are personal favorites, but so are PD James and Dorothy Sayers. So, from my stranding, I’m going to give up ballgowns and boas in favor of packing along more books. Agatha Christie and Rex Stout as the first pair, without a doubt. But of course there would be other pairs! 1.Jane Haddam and Emma Lathen(R.B.Dominic). 2.Charlotte Macleod(Alisa Craig) and Patricia Moyes. 3.Juliet Blackwell and Heather Blake. 4.Bailey Cates(Bailey Catrell) and Leigh Perry. Any one of these pairings or combos would be fine. The pseudonyms do count as one author, Right?! And (sigh), so many more. It might be easier to pick my top 25 or 50 to take, instead of authors. Right now I would say Kate Carlisle and Jenn McKinlay, as long as future books will somehow magically appear on the island. If I was looking for an author with a lot of books across a variety of genres I would select Catherine Coulter. I read her early regency romances and have followed her as she has transitioned to now writing some pretty intense suspense books. I don’t know if she quite fits in, but I’d choose Daphne du Mariner and also Wilkie Collins. They didn’t wrote as many books as some authors, but the ones they did are either long, or might be worth reading again. Both writers use that element of suspense, along with the kind if troubled characters a psychological thriller might have, but so far as I have read, most of them (maybe not all) are kinder and gentler on the reader than many modern mysteries. OH THIS IS NOT FAIR! I’ve managed to get it down to three, but I can’t make one of them go away, try as I might! Dorothy Gillman. I LOVE Mrs. Pollifax, although I haven’t read them in YEARS. Patricia Fry. I’ve just started reading the Klepto Cat series, and there are plenty of them I haven’t read yet. Shirley Rousseau Murphy. Joe Grey. ‘Nuff said. The thing is that all three of these authors write books that I could enjoy re-reading. Which is a good thing, since I can go through a book every two days, sometimes one. Of course, I would be gathering food, so that would slow me down some, but BOY, I hope I’m not there longer than a month! I’ll be quoting dialogue from the books in my sleep in six months. SO…which two? Definitely Murphy, and the other two are up for grabs. This is tough and I love your choices but…Gladys Mitchell and Dorothy Gilman or Charlotte MacLeod. If stranded on an island, my go-to authors would be Susan Wittig Albert (China Bayles series) and Carolyn Hart (Death on Demand and Bailey Ruth series). These are the series that I literally count the days until the next one is released! Strong, consistent, and dependable writing with engaging characters. Krista Davis and MC Beaton. Cozy mystery royalty!!! Lillian Jackson Braun and Charlotte Macleod. Agatha Christie would be my first choice. I am currently reading Cave of Bones, so I immediately thought of Anne Hillerman, but would want Tony’s books also. Krista Davis, domestic diva, and Sofie Kelly, magical cats. I think there would have to be cats so lilian Jackson braun and Rita mae brown! This is nearly impossible. I’d choose Dorothy Gillman because Mrs. Pollifax would get me off the island! Maybe Kate Kingsbury for a second. I love the Penneyfoot Hotel series! Gail Bowen and Susan Wittig Albert. My first choice is the late and great Elizabeth Peters! Her Amelia Peabody series spanned two decades. It is a tough call but I’d have to declare Rhys Bowen’s Royal Spyness mysteries my second favorite. Lady Georgianna Rannoch is a comedic gem! Hi too difficult. I like the classic British Library Series. But I have to pick Elizabeth Peters. Amelia Peabody is a fabulous heroine. I love Rhys but rhink I will choose Dorothy L Sayers and Lord Peter Wimsey as my second. But I would like to ask is there a lending library between the desert islands? Some awesome picks in your lists. This is really hard whenever I’m asked, but today I’m going with Anne Perry and the Thomas Pitt series plus Laura Childs and any of her three series will keep me reading but particularly the Tea Shop Mysteries. Agatha Christie definitely, but then, like others, I’d have to stretch things to three. Sir Arthur Conan Doyle’s Sherlock Holmes books (Which I’m currently re-reading) and Hans van Gulik. The Judge Dee mysteries. Do I pick my favorite feel-good cozy authors? Or my favorite laugh-out-loud cozy authors? Or the one with the longest list of books so I don’t run out of reading material??? Ok so… Dorothy Cannell and Rhys Bowen! Can I come visit the folks packing Donna Andrews & swap books with them at some point??? ??? If we were all there, like Gilligans Island, we would certainly have a nice variety of reading material. Everything from the most classic of classics to newer author – love it. You don’t really expect me choose just two authors! So many to choose from. Sorry?? Since I found this site I’ve discovered many favorite authors (Charlotte MacLeod, Lee Harris, Patricia Moyes, Dorothy Gilman…plus a few others). Years ago while browsing library shelves I discovered Philip R. Craig and William G. Tapply and eagerly awaited their new books each year. Craig and Tapply would go with me as I would feel like I found old friends. The second one was harder as I enjoy many authors. I chose Ann Cleeves as she always writes quality mysteries. I think every time I read her books that I bet Louise Penny fans would like her books. I enjoy her Shetland Island series and her Vera Stanhope series. Wish her Vera TV series was shown where I live. You’re right Danna. I have different choices than I did several years ago when you asked this question. Like my fellow readers it would be a hard decision but since I always overpack I’ll go with Rhys Bowen, Laura Childs love scrapbooking series. I am waiting with baited breath for the next books in their series (love Lady Georgie). Also the Agatha Christie books are great, maybe this time I’ll guess the killer. I agree with all the comments that this is just too hard LOL! Agatha Christie is a must, but for the second it would be a tossup between Mary Higgins Clark, Mary Stewart, Phyllis A. Whitney, and a few others as well! So hard to decide! Can’t just pick two! But Carolyn Haines, Duffy Brown, Lea Wait & Susan Wittig Albert would be a start. Rex Stout (Nero Wolfe) and Laura DiSilverio (Mall Cop, Readholics & Swift Justice series). I would like Agatha Christie, Ellery Adams on the island next door! LOL!!! Cleo Coyle and Laura Childs because when I read these two authors it’s like reading stories about close friends. Love that one series is set in a coffee house in Manhattan and the other series takes place in a tea shop in Charleston. Jess Lourey and Janet Evanovich and Laura Levine. I need all three to keep my sense of humor! I would choose Phoebe Atwood Taylor because she makes me smile and Patricia Wentworth because she was a romantic. OK, guys…we need to all be on the same island! Not only could we do a good division of work, but we’d have one HECK of a library going on! I’d go with Agatha Christie and Dorothy Gilman but there are so many more I would want on my island too. This would be a terrible choice, but I do hope we all get stuck on the same island, cuz I could read all of those books again. But I think my books would be books I’ve already read several time over. Not mysteries, or current writers, but Miss Read, and Angela Thirkell. British authors who wrote quiet books about families, and yes, you do get sucked into the lives of these villagers. And I have been known to read all 27 or more of them, one after another. And i guess in a way, they ARE cozy, just not mysteries and no murders! Maeve Binchy does that for me as well, with village life in Ireland. I read her books over and over again. I sink into those stories like a warm tub on a cold day. Dorothea Benton Franks does very much the same sort of thing, but set in the low country of South Carolina.